ICE South East works to inspire the next generation of civil engineers and help young people learn about the profession. Our members visit schools and careers events in the region to explain what civil engineering is and how it shapes our world, and help them find out about working in the industry. The ICE South East team also provides resources and support for teachers who are organising civil engineering activities, and anyone who would like to promote the profession. Take a look at the resources we have to help you organise activities and promote civil engineering. Find out more about how we've been working with organisations across South East England to promote civil engineering to young people. ICE members attended 57 STEM careers events and engaged with more than 3,350 school children in the South East last year. To celebrate Tomorrow's Engineers Week, ICE members took part in a talk explaining what engineers do at Chalfont Community College, a careers speed networking event at The Downs School and an interactive careers fair at Addington School. Tomorrow's Engineers Week is a campaign organised by industry and the government to raise the profile of engineering and help young people find out about the exciting and rewarding careers the industry has to offer. ICE South East members also run interactive stands at various events which have included: the Brighton Science Festival, Big Bang Fairs to promote science, technology, engineering and maths, Teen Tech events, the SATRO Festival and the Solent Skills Festival. ICE members volunteer their time to talk about civil engineering at careers fairs at a number of South East schools which have included: Cherwell School, Royal Grammar School, Little Heath School, Maiden Erlegh, Claverham Community College, Portsmouth Grammar School, Magdalen College School, Edgbarrow School, Ashford School, Aylesford School and Reading Girls School. ICE South East is always looking for more ambassadors, and to visit new schools. If you'd like to become an ambassador, or need help organising an engineering event at your school, then please get in touch with Vilma Marques at: [email protected]. Reading Borough Council has two new public transport interchanges and public squares. They're situated north and south of Reading Station and compliment major improvements that are being made to the station itself. The project provides new high-quality public spaces and public transport facilities for the growing number of people using the expanded station and surrounding area. Work has also been completed on Station Hill to the south of Reading Station. A 1937 reinforced concrete podium structure, originally built to raise the road to the same as the tracks, has been partially demolished to create a split level south-west interchange and level access to the refurbished subway that runs under the station. A new set of public steps now joins the upper and lower levels following significant ground improvement works, utility diversions and a new 5m-deep surface water sewer. A ramp was constructed by Network Rail between interchange levels and 25 new trees were planted. The upper public square adjoining the new station building, 1980s Station concourse and original Grade II listed station building (now the Three Guineas Pub) has also been transformed. It provides a high-quality public space linking Reading Station with the town centre and nearby development sites. Facilities to the north of the station provide a new public transport interchange, bus lanes, upgraded pedestrian and cycle routes, and a gateway to the new Network Rail northern station entrance. The Kings Road Arches on Brighton's seafront were built in 1880. 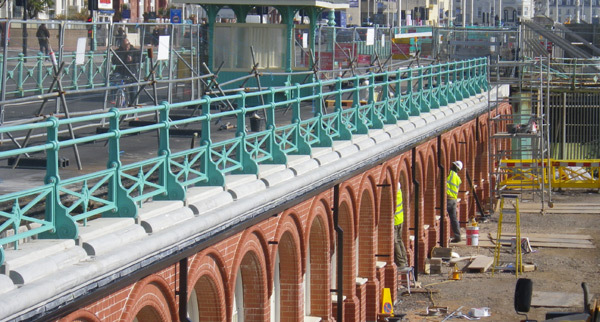 They support the seafront promenade and Kings Road, and are a vital part of the city's seafront infrastructure. The buildings have been unoccupied since 1991 due to their poor and deteriorating condition. Brighton & Hove City Council wants to transform the arches into a dynamic new artists and artisans 'quarter' on the seafront, as part of a wider programme to revitalise that area of the beach. With 30,000 vehicles a day using the road, the new design has to be much stronger than the original, to meet current safety regulations. However, it must be contained within the same space as the original structure. The new arches design will be a major piece of structural civil engineering - effectively a new structural section of road separating the sea and the town. It also represents a significant piece of architecture as it will carefully replicate the previous building’s brickwork. ICE South East England has strong links with every higher education institution in the region that offers accredited engineering courses. Its Graduate and Student Committee organises a wide range of events - many of which are free - with universities and colleges to encourage students to join in, and to develop their knowledge and skills.